The Adagio concert teapot is the first in this lineup of reviews that shows just how the traditional art of tea making does not have to be affected by modern design. This teapot is made from tempered glass that allows you to see your best teas brew and then beautifully rest over a candle held by a well-crafted wooden stand. If it comes to showing off your love for tea, this 37 Oz. 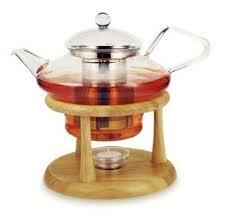 teapot is a strong contender beautifully using glass, wood and stainless steel for a functional piece that stuns guests.